The West River Trail is open. Near the Marina Trailhead, there are intersections between construction access and the trail path, and users should exercise extreme caution at these intersections. As an additional safety precaution, users of the West River Trail are reminded to keep pets on a leash in this area. 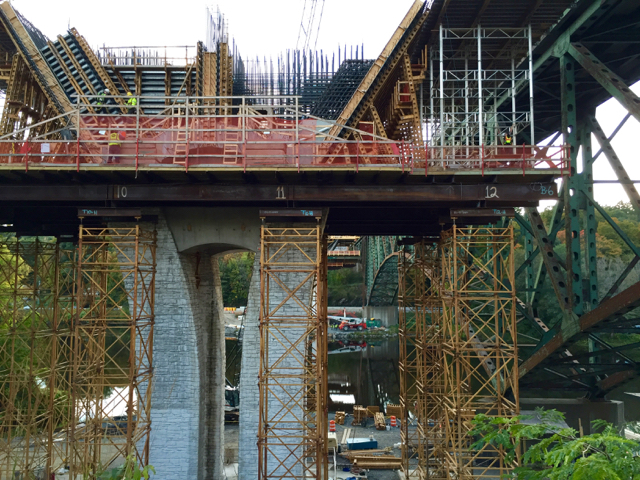 Interested in learning more about the new I-91 Brattleboro Bridge? Monthly trail talks are held by the Project Team to share construction progress with the public. There is a Trail Talk today, October 10th. The next one is scheduled for November 14th. Interested participants should meet the PCL+FIGG Team at the West River Trail Marina Trailhead on Saturday, October 10, 2015, at 8 a.m. and the talk will begin at 8:15 a.m. Participants will walk the trail to the I-91 bridge site. The project’s website features up-to-date information about the project, construction photos, and live traffic cameras. If you would like additional information, or would like to be added to the email distribution list for all project updates, please contact Cindy Cook, Public Relations Officer, Adamant Accord, Inc. ccook@adamantaccord.com. This entry was posted in lower section, vermont, west river trail and tagged I-91 bridge construction, trail talk, west river trail. Bookmark the permalink.